Do you travel by train? And definitely, you use WhatsApp. Then suppose if you could check your train's live status on WhatsApp then wouldn't be amazing? 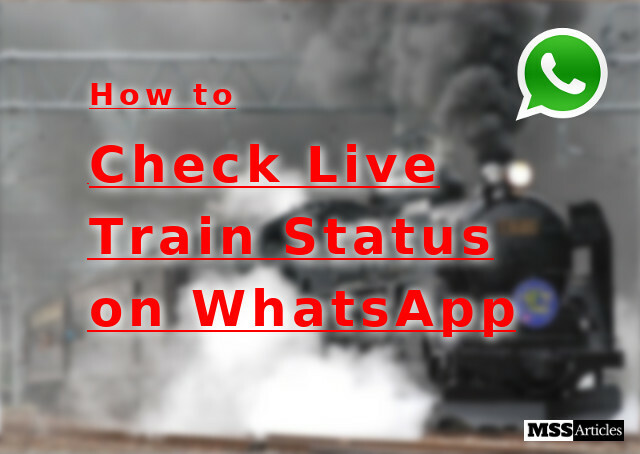 So in this article, I am writing about "How to check live train status on WhatsApp". Although checking live train status is possible on many applications and websites, but it will be easier if we get these statuses on our favorite messaging app - WhatsApp. Let me tell you this feature on WhatsApp running by MakeMyTrip. 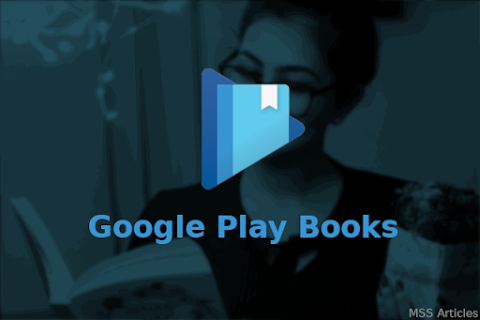 Save "+917349389104" in your contact list and open WhatsApp chat with this number. If you are a person who doesn't want to save this number as I do, then here is another alternative for you. https://wa.me/917349389104 Click on this link to open the chat directly without saving the number. When you click on this link, it will ask you to message this number on WhatsApp, click on "message". 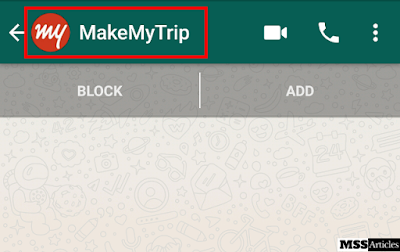 When you click on "Message", it will open a chat with this number on your WhatsApp with the name "MakeMyTrip". Opened chat when I click on the link given above. 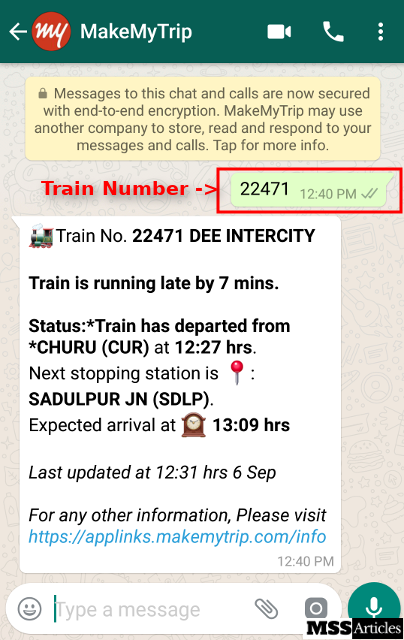 To check the Live status of a train, you have to send the train number on WhatsApp to the number mentioned above. You don't need to mention that "it is train number", just send train number. To check PNR status of your ticket, you have to simply message PNR <Your PNR Number> to this number on WhatsApp. For example, suppose a PNR number is "1234567890". Then to check its status, your message should be "PNR 1234567890". 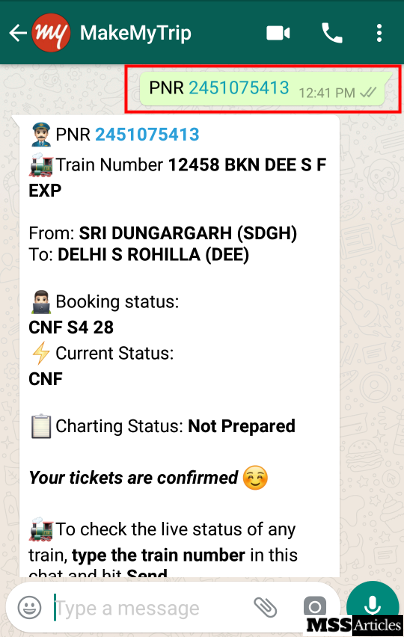 So this is the way to check train live status and PNR status on WhatsApp. Now you can check your train status in slow internet also because WhatsApp can run in slow internet also. Now you also don't need to call 139 to check your train's status. Simply launch WhatsApp in your phone and send your train number as a message to +917349389104 or click here to open the chat without saving that number. If you have any confusion, ask in comments. If you found this article useful, please give a Thumbs Up below.